A short while ago we reviewed SuitSupply’s casual button-up shirts, and we promised a review of their dress shirts. Here is that review. We took a look at their $99 Extra Slim Fit dress shirt in white. As always, the shirt lives up to the usual level of SuitSupply quality. Everything feels premium and super nice. The fabric is 100% Egyptian Cotton and has a unique and incredibly cool, almost pique-like texture. It’s unlike anything I have ever seen on a white shirt before, and is a subtle way to bring real style detail to an otherwise plain and classy white shirt. It wears incredibly comfortably, and feels smooth on the inside despite its outer texture. 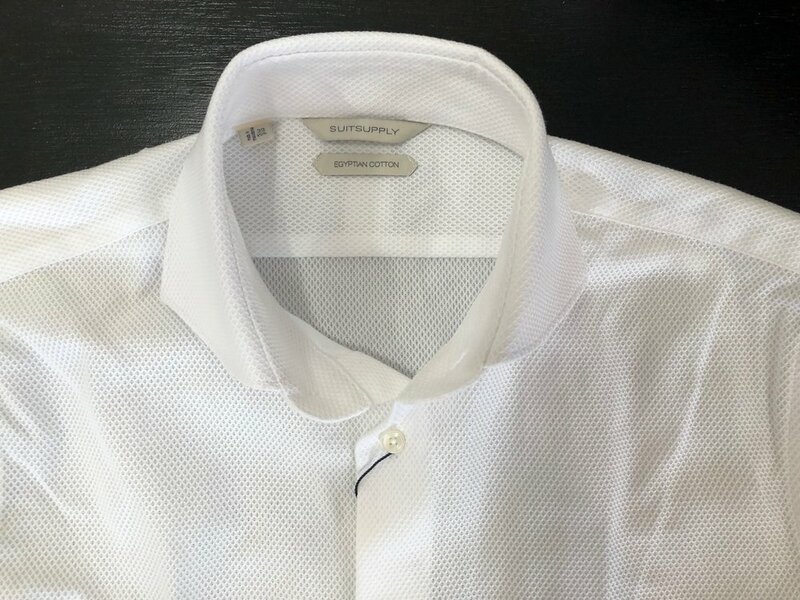 In short, it is a unique white shirt, which you would think is usually an oxymoron, but is really exactly the sort of thing you shop at SuitSupply for. The collar is structured, without being overly so. It also sits/rests nicely on the shirt, even with the top button unbuttoned, and even despite it being a cutaway collar — a sign of a quality shirt. All the buttons feel sturdy and well-sewn, and, again, everything about this shirt just feels high quality. It is exactly the quality you would expect form their suits. It is not the single nicest, highest quality garment on planet Earth, but it’s very high quality, without question. It’s upper tier, but not the uppermost tier. Summary: As far as quality and construction of SuitSupply’s dress shirts are concerned, there is nothing to complain about whatsoever. As discussed above, I love the textured style of this shirt. I don’t think this sort of white shirt should be your only or first white shirt, but it’s a fantastic and unique addition to any shirt collection. It’s super nice, luxurious, and a fantastic subtle detail in an outfit. The other very noticeable thing about this shirt is its substantial and cutaway collar. This is a style detail that SuitSupply is known for, and something I really appreciate and like. It is, of course, a matter of preference, but I despise the modern, tiny, very pointed collars that are trendy now. I much prefer the more substantial, classic, wider and longer collar-point collars that SuitSupply uses on their shirts. This shirt has their signature curved cutaway collar and it looks absolutely amazing. It neatly tucks under your jacket lapels — a style rule that many shirt makers seem to have thrown to the wind, with their tiny collar measurements. It also looks absolutely killer with a tie and, I think, pretty cool without a tie also. Again, collar styles are a matter of preference, but I really appreciate SuitSupply’s use of the more classic, wider, and longer collars. They are harder to find than you would think, and these classy details is part of what you are paying for when it comes to SuitSupply. Summary: SuitSupply favors more classic, and substantial details. You see this in their wider lapels in the suit jackets, and with their shirts, you see this in the more substantial collars. I love these details, and think they go a long way. Their fabric choice in this shirt, and in general, are fantastic as well. Only positive things to say here. As far as specifics go, some very slim shirts get too extreme in the chest and waist, and the shirts end up oddly curving inwards around your back instead of draping flat and straight. The SuitSupply shirt drapes super nicely. It fits very well in the chest and waist. It could maybe stand to come in just a pinch in both areas, but overall, the changes here would be very minor. More importantly, and something most other companies get totally wrong, is the sleeve fit. SuitSupply’s shirt has a higher armhole, and slimmer sleeve, that fits a slimmer build like mine absolutely perfectly. It’s not too tight, but not super wide like many other allegedly slim shirts. Plus, they reduced the wrist opening size also, something that companies like Charles Tyrwhitt seem to forget to do on their slimmer shirts, so the shirt sits nicely on the wrists without sliding down and looking droopy. One gripe, though: Their collars seem to fit smaller than most. While a 15” collar fits me perfectly on most shirts, their 15” buttoned around my neck only with great difficulty. I tried a 15.5” from them too, and while the collar fit me correctly in that size, everything else was too big and long. While I could have the button removed and re-sewn closer to the edge to make the collar fit better (and while it’s always possible that this problem is maybe only on this fabric type), I had to return the shirt because of this problem. For $99, I didn’t want to be making such alterations. Summary: All in all, the fit here is really a home run. It’s slim without being too slim, and the sleeves and wrist — two areas often overlooked — fit perfectly. However, the collar fits about 1/3 of an inch tighter than most other brands. SuitSupply’s suits give you quality that far surpasses what you pay, making them a fantastic value. Some of their construction rivals suits that are usually priced at two or three times the price of SuitSupply. Their shirts, however, do not follow exactly the same trend. This shirt costs $99, and while it is definitely high quality, and on par with something you would expect from SuitSupply, you’re not getting more quality than what you’re paying for. In fact, if anything these shirts are a tad overpriced. Some of their shirts are available for $79, and I think that is a much more fair price, and a better value. (On that note, if you ever get these shirts during an outlet sale, they are an absolute steal at well under $40 very often.) Again, this is not to say there is anything wrong with the shirts itself, just that they are pricey (much like their sweaters — review forthcoming — and other of their accessories… quality, but pricey). Comparison to Charles Tyrwhitt: Compare this SuitSupply shirt to something like a Charles Tyrwhitt shirt. CT’s shirts use basic, plain fabrics, that often don’t feel amazing. Their fits are okay, but not fantastic, and neglect things like slimmer wrist sizing, and higher armholes. Plus, while they offer spread collars, they still do not quite match up to the larger and more prominent point widths or stylings of SuitSupply shirts. Then again, CT’s shirts can often be had for about $35, and at that price, are a great value. There is no question that the SuitSupply shirts use better, higher quality, and more premium fabrics, fit better, and have greater attention to detail. But they also cost three times the price. Do they bring three times the value? Maybe not, but between the two, I’d rather fewer SuitSupply shirts than more CT shirts, though both have a place in my closet. When all is said and done, I would pay $99 for a shirt that fits me this well, and that is of this quality, even if it is a bit more than what I think is fair. An off the rack shirt like this is hard to find.